You can go far away from the power grid and still get connected to the rest of the world. 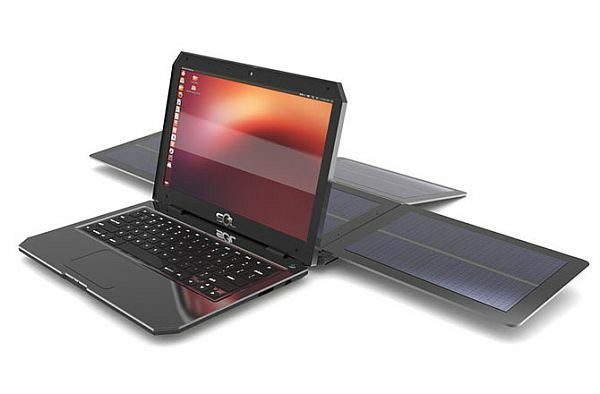 You can do so with the truly independent laptop, the SOL which can be powered by just "plugging" it into the sun. During night time, or when the sun isn't there, you can run it all night long with its powerful battery, claimed to be up to 10 hours! SOL laptop comes loaded with all the productivity and creativity tools you need. Since there are thousands of free apps available online, you don't need to purchase any more software to get started. Since it runs on Ubuntu (not Mac or Windows) operating system, it cost you nothing to power it up and running. The laptop has built-in foldable solar panels, and the Canada-based makers behind the SOL claim that the device can run directly off solar energy or can harness the sun’s rays to charge the laptop’s battery in under two hours. Once fully charged, the battery is expected to last between eight and 10 hours! From the above information, it is clear the laptop is packed with mid-range specs but what sets it apart from the rest is that it's designed for use in the military, education and developing countries where electricity is scarce. It is not the first solar-powered laptop, but previous products such as the Samsung NC215S netbook don’t claim 10 hours of battery life on a single solar charge. It is slated to launch in Ghana, Africa first but with the attractive price, I'd love to see the laptop making its way into Malaysia. Perfect for the grid-power-deprived folks in the not-so-rural-areas in Sabah. Android os Laptops are nothing but laptops with a touchscreen monitor technology. Best of luck with that.